The trombone offers a special sound to classical music. Every red-blooded American of a certain age knows what a trombone is, thanks to a famous song that has 76 of them. The trombone is the quintessential parade instrument; no marching band would be complete without it. It’s a powerful low brass instrument. But this characteristic is just one of the trombone’s many sides. It can also play noble, beautiful tones. The trombone’s basic design hasn’t changed much in more than 500 years! Amazingly, the trombonists of the Renaissance played basically the same instrument as the one that is used today. (But back then, it was called a sackbut.) Here are some of the things that all budding trombonists must know. At first glance, you can easily see how the trombone differs from all the other brass instruments: It has a slide. To explain how a trombone works, let’s start with a trombone with its slide pushed all the way in. In this position, the trombone is as short as it can be. This is called first position. In first position, a trombone is capable of producing a handful of notes with the lips alone — just as the natural horn did. Try to play a B-flat with the trombone in this position. Simple enough. But what if you want to hear the note below this one — the A? That’s not one of your available notes. What do you do? You pull the slide out, just a touch, to second position. Now you’ve effectively made the trombone a bigger instrument, lengthening the tube so it can accommodate a longer column of air. As you may know by now, a longer column of air produces a lower note. Whenever you pull the slide out to the next position, the trombone lowers the sound by a half step. The trombone has seven slide positions in all; with the slide pulled out as far as it can go, it’s in seventh position. Together, the seven slide positions enable you to play any note imaginable. Trombonists become experts at finding the correct slide positions and correct lip positions for each note. 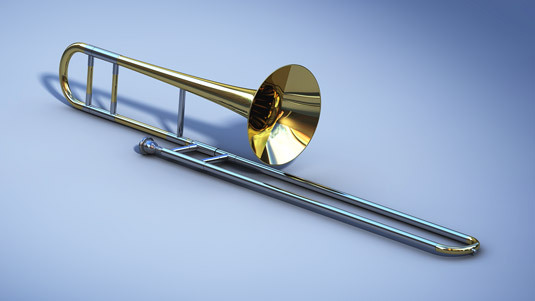 The slide makes the trombone unique among brass instruments — in more ways than one. If you move the slide smoothly between one position and the next, while blowing a constant stream of air into the instrument, you can make your trombone glide between the notes. You’ve probably heard this comical effect. It’s called a glissando (which literally means gliding.) The biggest glissando that you can make is the one that goes from one end of the slide to the other — that is, from first position to seventh or from seventh to first. A truly impressive effect — used in jazz and cartoon soundtracks even more often than in classical music. It’s a sad, sad fact that trombone concertos are extremely rare. Given the nobility and versatility of the instrument, they should be much more common.